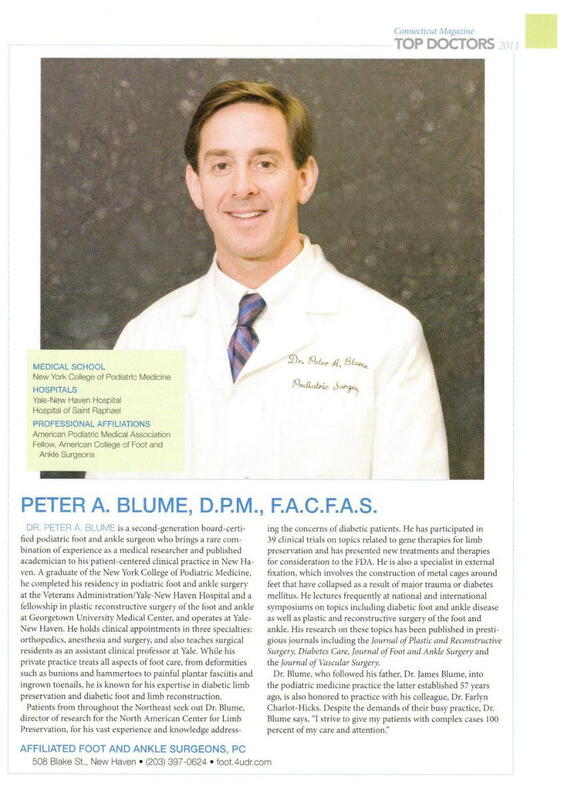 Dr. Peter Blume was once again voted one of Connecticut’s “Top Docs” in 2011. PETER A. BLUME, D.P.M., F.A.C.F.A.S. DR. PETER A. BLUME is a second-generation board-certified podiatric font and ankle surgeon who brings a rare combination of experience as a medical researcher and published academician to his patient-centered clinical practice in New Haven. A graduate of the New York College of Podiatric Medicine, Ire completed Iris residency in podiatric foot and ankle surgery at the Veterans Administration/Yale-New Haven Hospital and a fellowship in plastic reconstructive surgery of the foot and ankle at Georgetown University Medical Center, and operates at Yale-New Haven. He holds clinical appointments in three specialties: orthopedics, anesthesia and surgery and also teaches surgical residents as an assistant clinical professor at Yale. While his private practice treats all aspects of foot care, from deformities such as bunions and hammertoes to painful plantar fasciitis and ingrown toenails, he is known for his expertise in diabetic limb preservation and diabetic foot and limb reconstruction.